Dormouse insists that shooting foxes to protect sheep raises ethical issues that are indefensible. I disagree so I have tried to put together a moral justification for fox control. The case for mink control is even stronger, they destroy native wildlife. Foxes impact on the interests of Crofters and their sheep. Shooting is obviously against the interest of foxes and a class of people who consider it cruel and unnecessary. So any ethical consideration of fox control by shooting must take into account the interests of both animals and people. Fox control is only morally justified if all the harms (negative impacts) on people and animals (mainly foxes) are weighed against all of the benefits to people and animals (mainly sheep) and the benefits of control outweigh the harms in other words if fox control provides the greatest good for the greatest number. Further, the most humane method of killing foxes must be used and shooting is, in my experience more humane than trapping and killing by hounds. The Crofter’s interest is economic (loss of income) and moral (an interest in sheep welfare). Foxes have an interest in continuing to be foxes and to do what foxes do free of pain and suffering. There are more Crofters and sheep with economic and a welfare interests than there are foxes with an interest in being foxes and people who might be upset by the idea of fox control. Ergo shooting foxes to protect sheep is morally justifiable. My prediction is that Dormouse will say that moral philosophers are rascals; I am fudging the issue and not giving enough weight to the interests of those people who are against. You might have an opinion too. Foxes have been killing sheep again, not lambs but adult ewes so a fox shoot was organised yesterday. In Scotland it is legal to use hounds to flush out the fox and then drive it towards the guns. The fox must be shot and not killed by the hounds. Soon after the hounds started at Achosnich they picked up a fox in a patch of woodland at Garbh-dhail, this was the start of a marathon drive over the hills to Sanna, along the shore to Portuairk, up the Streathan Breigh burn , over to Sanna once more and then back to Grigadale. The result...... Fox 1 : Hounds 0. I imagined the fox or a tag team of foxes sitting in the bar at the Sonachan Hotel having a pint in the evening well pleased with themselves. Driving home from Fort William a couple of years ago I came across what I thought was a small herd of feral goats at the roadside between Glenuig and Salen.Over the years I've encountered feral goats from the Cheviot Hills to Loch Lomond side and the Isle of Rum they look like Ibex with large horns and shaggy coats. 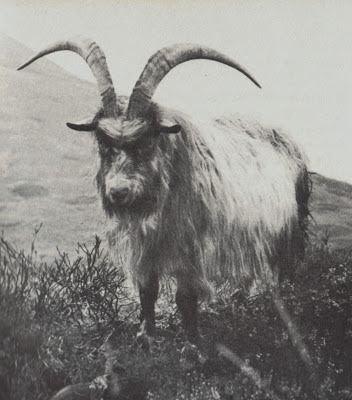 I have been trying to find out how; if these were originally domesticated goats they reverted to "wild type". I have searched the web to no avail. Am I missing something here that is so obvious no one needs to write about it? Or has no one bothered to suggest a hypothesis? There is a third possibility; these goats are the direct descendants of primitive goats that belonged to Neolithic people and have been wandering about Britain little changed ever since? Hypothesis: If I turned my female goats out on to the hill with a buck goat and just abandoned them. 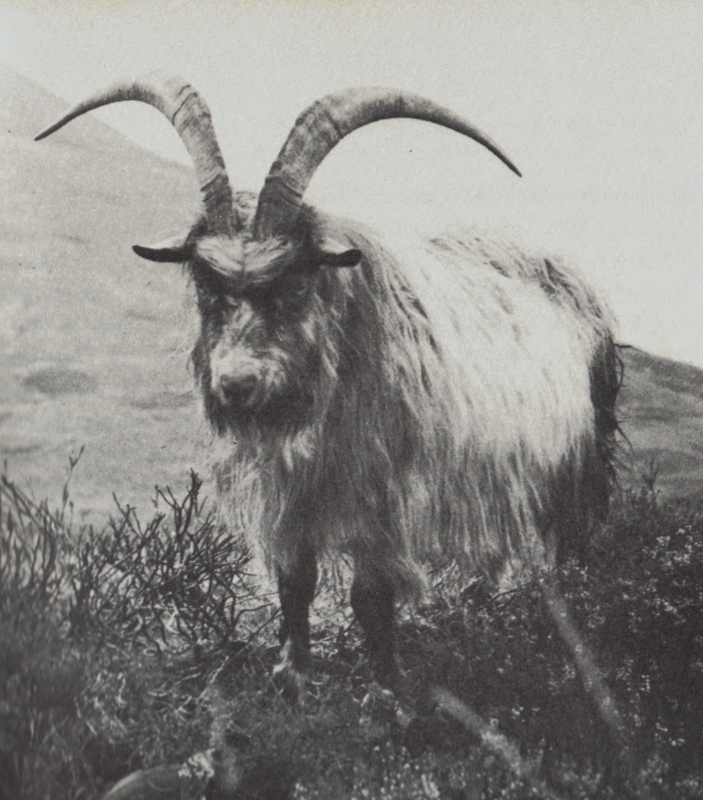 Then the harsh environment would act on their offspring to select a smaller, hardier, large horned, long coated, better adapted "wild type" goat in relatively few generations. There is one short paper by people at the Roslin Institute with an assertion that this would happen in about ten years but I can't find any other references. Don't worry I'm not going to test this by turning my goats loose. In winter the goats don't get much variety in their diet. They get as much hay as they can eat, some browsing on heather, rushes and bramble when they're on the hill; then vegetable peelings and leaves from time to time plus two feeds of concentrate a day. Fay Ogden suggested I walk them along the shore so that they could try the seaweed. After the last new moon and gale force winds there is a huge amount of kelp and other seaweeds along high water mark so I thought I'd do a seaweed tasting by bringing some home. They seem to like both the bladder wrack and the kelp equally. But like most of my observations this one is totally unscientific. Although it is low in digestible protein and energy seaweed contains a range of essential minerals and vitamins so it must do them some good and adds variety to the diet. On North Ronaldsay (Orkney) sheep live almost exclusively on seaweed; for most of the year they range along the sea shore between low water mark and a high stone wall that keeps them out of the grass parks. Despite the plentiful supplies of seaweed around the coast it has not been important as a livestock feed perhaps because of the difficulty of harvesting and the low digestibility of its protein. Where it is used it is rinsed in fresh water, dried in the sun, washed again, treated with hydrochloric acid and then dried and ground to a meal to be incorporated into livestock rations. On the plus side its high in essential minerals ( extracted from seawater) and some vitamins. Last night I ran a poultry keeping course for West Highland College in Ullapool, " A to Z of Poultry Keeping", for a mixed group of experienced and novice hen keepers. It wasn't too difficult to come up with twenty six different topics; the most difficult was Q. I could only think of quacking and quills. Quacking as a way of sexing ducklings at about a month old because the males have a deeper, hoarser quack, like a cartoon duck. Quills because my god daughter's sister, an artist, uses them to paint, a useful by-product of the goose enterprise .Everyone said that they'd learned something and enjoyed it so it was a success. However, it meant two days on the road on buses to get there and back. The van was parked overnight in the long stay car park in Ft. William and when I do this I'm always a bit surprised to find it there in one piece when I get back. There had been some interest in it; a line of footprints up the bonnet ( hood for readers in N. America) and on over the roof. The footprints were too small for a drunk so it must have been a child without a computer in his room. Just in case I'm asked to do this again I'd welcome any suggestions for Q related poultry topics. No prizes though. I sell hatching eggs and the two things that buyers are most interested in are the fertility ( the percentage of the eggs they buy that are fertile) and hatchability (The percentage of fertile eggs that hatch). Fertility can be 95% or higher early in the year but tends to decline as the laying year progresses and its largely down to the male getting older and and fatter then losing interest in his work. Cockerels mate about five times a day and hens every other day and he has a harem of 12 hens. You can do the arithmetic yourself. After mating the sperm is stored in the oviduct of the hen, enough for five or six days so its a rather efficient system. Asterix my Bresse Gauloise stock cockerel has only been on the job for six months and hasn't lost interest yet but his behaviour is monitored and batches of eggs are tested for fertility from time to time in the incubator. Like his jungle fowl ancestors Asterix has a territory and if there were other socially inferior males around he would monopolise the mating in that territory. If a high status male appeared on the scene there would be a confrontation along the lines of, "Oi you lookin at my birds"? followed by a fight, possibly to the death. Something you need to bear in mind if you intend to keep goats is their personalities. Of all the classes of farm animals I've worked with; cattle, sheep, pigs and poultry, goats are unique. Each goat has its own individual personality. Like cats they are independent, pushy and demanding of attention; focused on their own needs, but unlike cats they are intensely sociable. They need the company of other goats and you shouldn't keep one on its own. There is a social hierarchy of course often with the biggest individual at the top. Acorn the feisty Toggenburg kid is constantly challenging Pia who is almost twice her size like a teenager defying authority. At the moment the headbutting duels are short lived and playful but I can see a new order emerging. January is the month for sitting by a warm wood fired stove; reading or blogging, taking it easy, idling and planning for the year ahead. The first item on the " to do list" is to get the incubators out, cleaned and installed in the kitchen. They have to be in the kitchen as they need an ambient temperature of at least 15C, everywhere else is too cold and draughty. Mid month is an ideal time for the first setting of eggs and this year I want to get almost everything hatched and reared in one batch. The earlier hatched birds tend to be bigger and as they grow the day length increases, reaching 16 hours a day just as they start laying in June. Any later hatches of ducks or even geese will be small scale and natural; hatched and reared by a broody hen. Among the first batch for setting are a dozen eggs from Eire, Silkie x Light Sussex, these are the best broodies and should be available for hatching from late summer. Perhaps better if you can get them are Indian Game x Silkie hens, they used to be considered to be "hot" broodies because of their bigger breasts and legs they could cover more eggs at a slightly higher temperature. There should be a batch of Bresse Gauloise eggs coming from France and Ixworths from England, all of these batches have to arrive at the same time for setting and simultaneous hatching. After hatching they'll go into the new "high security" predator proof brooder house, it looks like a Securicor van without the wheels. Given our regular power cuts I also have to ensure that the generator starts first pull and keeps on running.